Last night the New York Times let slip that Grand Theft Auto IV pulled in more than $500 million in its first week, selling an astounding 6 million copies globally, 3.6 million of them on the first day alone. This morning Take-Two confirmed the report, adding some well-deserved back-patting to the numbers. To put it in perspective Halo 3, the previous record-holder, earned $300 million in the first week. "We knew Grand Theft Auto IV would break new ground in terms of the player's experience, with its compelling story line, extraordinary gameplay and action that ranges over a broad urban canvas. Now, it has broken sales and rating records as well. Grand Theft Auto IV's first week performance represents the largest launch in the history of interactive entertainment, and we believe these retail sales levels surpass any movie or music launch to date. We congratulate the entire Rockstar team on creating a must-have experience that takes the legendary Grand Theft Auto franchise to a new level," said Strauss Zelnick, Chairman of Take-Two. "Rockstar's goal is to make each new title in the Grand Theft Auto franchise even better than those that preceded it, and Grand Theft Auto IV is a smashing success on that score. 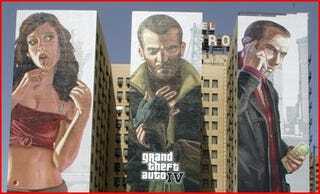 Grand Theft Auto IV makes full use of the power of next generation technology, and offers players an experience unique in the interactive entertainment medium. This game sets a new standard in the industry, with critics hailing it as both an artistic and technological masterpiece," said Ben Feder, Take-Two's Chief Executive Officer. The real question now is what this record breaking, Halo 3-smashing game will do to the EA/Take-Two talks.